This is a public service announcement to all listeners that we want your feedback. Send us your hate mail (questions too) at: heatbeatmiami@gmail.com, and we'll read it on-air. All of it. 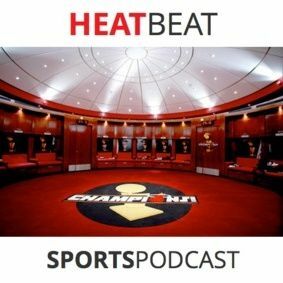 Gianni & Brian discuss 'Week 5' of the NBA regular season with Dwyane Wade cartwheeling around on his hobbled -- or maybe not so hobbled -- knees, and how the Heat are having the "most fun" out of any sports team right now. We read our first ever listener email from a fan out in ... See More London, and answer his question on whether LeBron leaves Miami or not during the 2014 Free Agency. And we go "Around The League" as we talk Derrick Rose, Dragon Ball Z, and spoil last week's Family Guy...oh and we close by almost forgetting to play the game that's still sweeping the nation, "Guess The Boxcore!"